Heroine's war against the future simmers, unfolds, bubbles up and explodes in our face. As we watch, Halla slips a green-stemmed metal arrow with a wire attached and points it skyward toward a giant electrical pylon with wires that reach out and disappear across the horizon. Halla, a woman in her forties, declares war on the local aluminum industry to prevent it from disfiguring her country. She risks all she has to protect the highlands of Iceland-but the situation could change with the unexpected arrival of a small orphan in her life. It makes contact. There are sparks, a sky burst of sparks exploding into the blue. The pylon falls and power goes out all over the country side. She packs up her gear and runs. Government helicopters float towards her across the hills and Halla picks up speed, and as she had done five times before, and runs for her life. One of the great moments of the film is when a mysterious white drone finds her while on a mission in the hills. Halla loads up her wired arrow and brings the drone down and smashes it to death with stone. Hold your applause. You’ll need it for the incredible final scenes. Those are the facts of the story that just float around our eyes, while the real story of this woman’s war against the future simmers, unfolds, bubbles up and explodes in our face. Prepare to be shaken, entertained and astonished by the cinematic mojo of this Nordic crew. This is the story of Halla, a fierce, intense middle-aged eco-warrior, born into the Icelandic culture, shaped by nature, and enraged and reshaped by the outside forces of “progress.” Halla is determined to keep her Iceland green and pure. She will apparently stop at nothing, not even the threat of death or imprisonment. The media is percolating with whispers of “Organized sabotage by a foreign terrorist group,” while Halla slides about her daily life as a choral director who smiles and chats her way through the day, cooking, cutting flowers and dusting the framed photos of Gandhi and Mandela that hang on her kitchen wall. Gradually, director Erlingsson begins to unwrap his box of surprises. We will be set on our heels by the arrival of Asa, Halla’s twin sister, a yoga master and zen student also played by Halldora. Both sisters flow through the days of their lives, one glowing with the serenity of soul, and the other with the intense heat of rebellion. Erlingsson and his cinematographer magician Bergsteinn Björgúlfsson keep the politics in the shadows, and wisely focus their energies on the magical, almost mystical journey of Halla and her two faces: woman and warrior, and the spiritual intercession of her sister. Employing the tricks of the fictional hero of the French Revolution, the “Scarlett Pimpernel,” Halla consistently misleads her friends and enemies and entertains us with her maneuvers, until one day a letter from an orphanage in Ukraine turns everything inside out and alters the focus. On top of it all, I can guarantee that you will not be prepared for director Erlingsson’s bag of cinematic tricks, both humorous and mystical. There will be a group of women singers dressed in colorful ancient traditional Ukraine costumes, and later a trio of village pub musicians; on mountain fields, offices and side streets, in all the moments of Halla’s joy and danger, like ghostly Greek choruses. No one but Halla seems to see them. You will. “Woman at War.” What we all want in these stressful weeks — a delightful surprise. 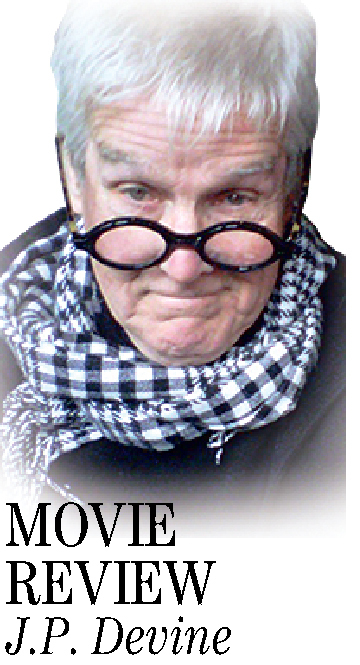 J.P. Devine, of Waterville, is a former stage and screen actor.